Rolls Royce audio diagnosis, repair & upgrade, including: DVD, Bluetooth, DAB Radio. Apple CarPlay and Android Auto installed. We specialise in MOST optics and all diagnostics and repairs carried out on site. Find out why Rolls Royce owners trust us to take care of their electrical & audio upgrades and repairs. We upgraded this classic Rolls-Royce Silver Shadow with Apple CarPlay, Android Auto, Waze and Digital Radio (DAB+). See how we brought the audio and visuals up to date on this beautiful Rolls Royce Phantom. In this lovely Rolls Royce, we replaced the old fashioned radio with the latest Apple CarPlay and android Auto system. This is a great upgrade to update your Rolls Royce. Take a look at how we sorted out this Rolls Royce's Audio Issues. In-house, on-site repairs to Rolls Royce Phantom audio systems, if your Phantom has audio issues read on. 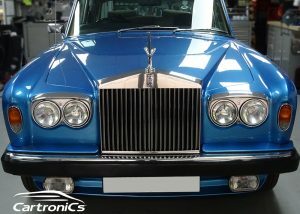 We can retrofit TV's, Digital Radio (DAB) and provide handsfree bluetooth in any Rolls Royce.